US pop artist Robert Rauschenberg died yesterday aged 82. He was apparently raised as a Christian fundamentalist, but gave up his plans to to be a minister because his church banned dancing - I guess they might have had a problem with him being gay too. His passion for dance led him to design costumes and sets for dance companies over a 50 year period, working particularly closely with Merce Cunningham. 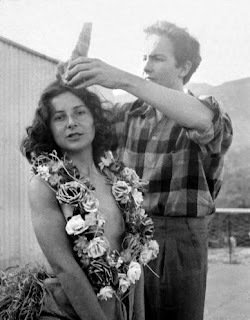 This 1949 picture shows him with a unicorn Mardi Gras costume he designed while at Black Mountain College, worn here by one Inga Lauterstein.